We are committed to sharing the tradition of Iyengar Yoga. Iyengar Yoga differs from other styles of yoga, as there is an emphasis on the precision and alignment of asanas, (postures) planned sequencing and timing. The use of props such as blankets, blocks and straps to support asanas, is common in Iyengar yoga. This approach allows people of varying levels of health, fitness and age, to discover the benefits of a sustained yoga practice. The international certification mark of Iyengar Yoga teachers, ensures that those teaching Iyengar Yoga are qualified to do so. 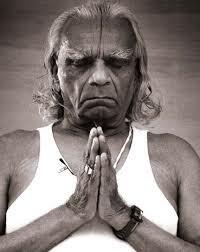 The certification process was introduced in Australia in 1987, by Senior Australian Iyengar teachers of the BKSIYAA, with the guidance of Guruji, Yogacharya BKS Iyengar. The teaching certificates issued by BKSIYAA on behalf of the Ramamani Iyengar Memorial Institute in Pune, India; are recognised globally, and are the international mark of a qualified Iyengar Yoga teacher.